_____ and ___ you have just sealed your relationship with the giving and receiving of rings. Now we shall celebrate your new union as it is symbolized by the tying of a fisherman’s knot; a true lovers knot, for it is the strongest there is; its bond will not break, becoming ever stronger under pressure. These two cords represent your individual selves and the unique and special gifts you bring to your marriage. As you fasten your pieces together, this represent the joining of your two lives into one common purpose. 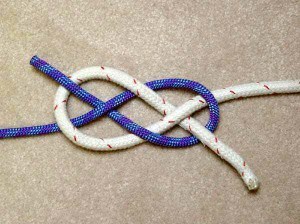 The completed knot represents your future, secure in the knowledge your relationship will continue to be strong despite the inevitable changes life brings. Although the fisherman's knot is one of the simplest to tie, it is also one of the sturdiest. As stress is applied, the knot becomes ever stronger. As you hold one another in mutual concern and shared respect, may you continue holding each other tightly in your hearts and form a strong bond, now and forever. May this love knot be a reminder of the strength of your love and the binding together of your two hearts.